'Breezy and windy with some snow' Jump to media player Forecaster Derek Brockway describes heavy rain, wind and some snow for Thursday. Bitterly cold night forecast for Wales Jump to media player Monday will be the coldest December night since 2010 according to forecasts. 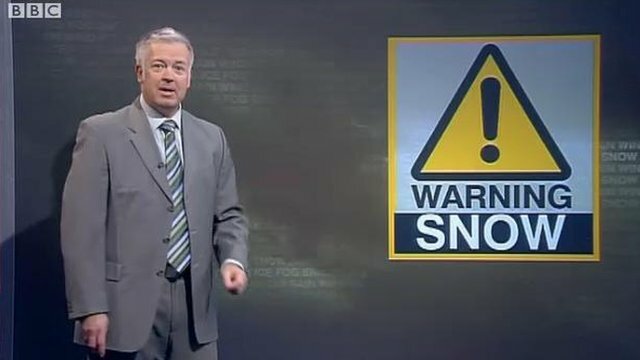 Heavy snow forecast for SE Wales Jump to media player BBC Wales weather presenter Derek Brockway warns more snow is expected. There will be strong winds in parts and snow on higher ground on Thursday, said BBC forecaster Derek Brockway. But heavy rain will melt most of the snow currently on the ground overnight. However, some more will fall on higher ground.